Eclipse Sun Shade- A shady barrier between the blazing sun and your interior surfaces. Block out every bit of UV radiation! The self-retracting Eclipse Sun Shade is one of a kind! Not only is it a good-looking, quality shade, but this manufacturer put serious thought and deliberation behind the design. The Eclipse SunShade is customized for your vehicle; there are no awkward gaps where the sun peeks through. A beveled bottom edge where it meets the dash prevents bunching. The shade mounts to each side of windshield so it’s always right where you left it. Mounting the shade requires no tools or drilling. Remove it at any time. To close the Eclipse Sun Shade, simply pull each side of the shade together in the middle of the windshield. Velcro® brand fasteners hold it shut. When not in use, each side of the shade folds up accordion-style at the sides of the windshield. The shade will not block your view of the road. The Eclipse Sun Shade works just as well on rear truck windows, conversion vans, sunroofs and boats. This is the best on the market today for keeping out UV rays. The design of the Eclipse Sun Shade is what sets it apart. The sun shade is sleek and classy looking. It fits your vehicle precisely, literally sealing out all harmful UV rays. Anyone can install it correctly in a few minutes. The Eclipse Sun Shade is incredibly easy to use — no tools are needed, and no adhesives on the posts or dash. The sunshade attaches directly to the windshield with aggressive bonding, high-tech adhesive. It opens to a very compact, inconspicuous column tightly along each windshield post. If you’d like, the blinds are easily removed with a simple twist of the wrist. The Eclipse Sun Shade’s automatic retractor system has been tested for a minimum of 1200 cycles guaranteeing that it works the way it’s supposed to, time and again. It has also been tested for longevity in extreme climates, and proven its high performance. The advanced, unique retraction system is constructed with daily use in mind. In fact, the Eclipse Sun Shade comes with a one year guarantee against any defect in workmanship or material. Extra-strong spring steel, durable, double-sided fabric, high temperature nylon retractor modules, self-lubricating retractor spools, and heavy brake load monofilament cord are the players that make this sun shade superior to all others. Only the best, quality parts go into the Eclipse Sun Shade, which is why it’s better than all the rest! The sturdy, premium quality polyester and leather pull-tabs are an attractive complement to today’s cars. The metallic exterior reflects all light away from your dash and upholstery, eclipses all solar radiation, prolonging the life of all interior surfaces. For the discriminating car owner, the Eclipse Sun Shade is the way to go for total interior protection! The Eclipse Sun Shade is available in silver-gray. Eclipse Sun Shades wider than 30 inches are an additional $10. Use the chart below to find the right sunshade for your vehicle. *This item is shipped from the manufacturer. Please allow approximately 1 week for delivery. Express shipping and International shipping are not available on this item. 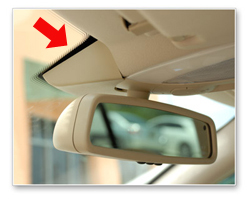 Does your windshield have a sensor like the one shown in the picture to the right? Please answer yes or no in the order form below. Very easy to use. Have used one for about three years. String broke a few months ago and bought a new one. Replaced broken side. Will save second piece for when string breaks. ProsEasy to set up and use. ConsPrice a little high, but worth it. Blocks about two inches of windshield on driver side, but not really a problem even though I have a small Honda civic. This is my 4th shield, for the different cars and trucks I've owned through the years and this item is excellent for the purpose it is designed for. Been using it in Virginia, Florida and Texas. Really need one in Texas. Good quality, good price. ProsQuick and easy / good looking too !! ConsOn your big trucks, got to stretch a little to close.